A team of meteorologists from the National Weather Service in Peachtree City, Georgia, surveyed the damage caused by a supercell thunderstorm that tracked across northwest Bartow and central Gordon counties from approximately 11:15 a.m. to 11:55 a.m. on Wednesday, January 30, 2013. The tornado was rated at the high end of EF-3 with an estimated peak wind at 160 MPH. The path of the tornado was 21.8 miles long and, at its maxium, was 900 yards wide. The tornado resulted in one fatality and 17 injuries. Nine injuries were located in Bartow County and eight were located in Gordon County. In Bartow County, at least 95 structures were damaged. Thirty-one were destroyed, 17 sustained major damage and 47 sustained minor damage. Most of the damage occurred as a result of trees falling on homes in downtown Adairsville. In Gordon County, 268 homes suffered damage. Of these, 30 were completely destroyed, 110 sustained major damage and 70 sustained minor damage. Sixty-six of the structures damaged were mobile homes, and 202 were single-family homes. 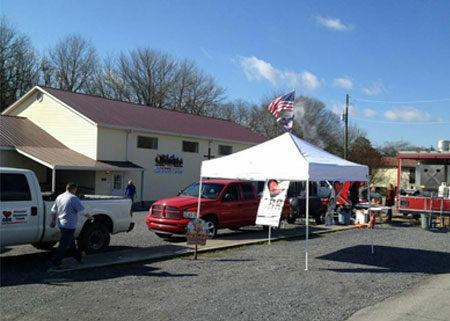 OBR arrived in Adairsville less than 24 hours after the community was rocked by the tornado, a record for us. In three days, when a shocked and dazed community needed it most, volunteers served up 5000 meals. Our volunteers and donors made this very impactful operation possible, and we thank you all!